Nothing terribly exciting to report. 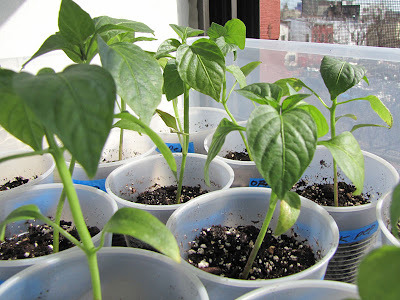 Most of the peppers and eggplants have been transplanted into larger pots. I sowed the tomato seeds last week and the cantaloupe seeds a few days ago. So far, I've had a 100% germination rate. Hopefully I can maintain this record when I sow the cucumber seeds at the end of April. i'm a first year gardener. almost all the seedlings that have sprouted in the past month have failed and died! i've re-sown a bunch last week, the tomatoes seem to be doing well, the peppers and eggplant not so much. maybe i'll give them some more time. 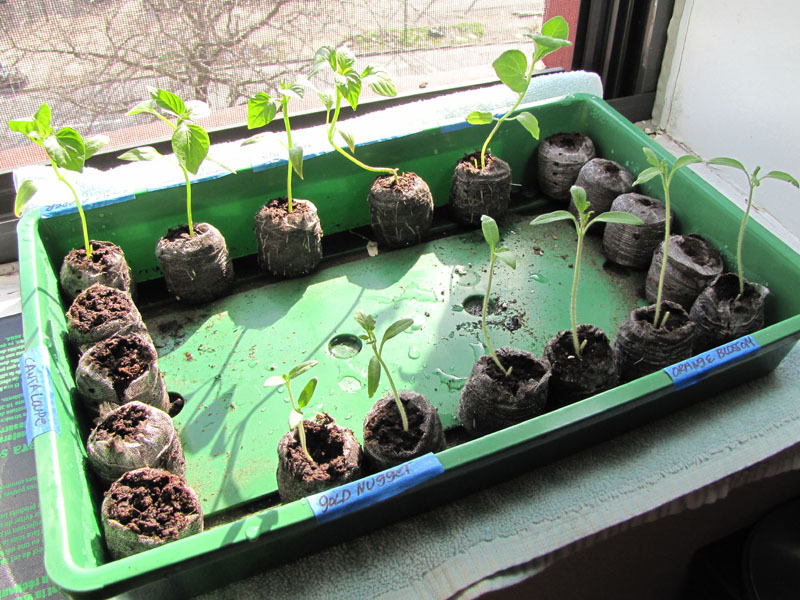 anyways, i was curious: are those little plastic cups the larger pots you transplanted to? also: when did you take the hood off the seedlings? Hi powkang, yes those are just extra party cups I had around. I poked holes in the bottom for drainage. I never really took off the hood. When they sprouted those first 2 leaves I cracked the hood open for air circulation, but never removed it. All the seedlings stay in the dome until they get moved to the cups. I think what seedlings need the most at first are warmth and water, but not too much water. I struggled with over watering the last 2 times. I hovered like crazy. This year I was able to break that habit. I kept the soil moist, but not swampy. For warmth I had a heat mat, that -really- helps, especially when the windowsill gets chilly at night. If your seedlings don't work out I'd be happy to give you my extras. Just email me if you want to accept my offer. thank you so much! this is very useful information. now that i look at it, it seems the peppers and eggplant are coming, they're just coming along slower. i think they'll be okay. i see an eggplant sprout. it does probably want things a bit warmer. i was putting the tray on my stereo cabinet in the evenings to give it some warmth, but that spot doesn't get any sunlight. maybe i should bring the space heater in here. i can't really sink anymore money into this, though i'd love to invest in a heating pad and/or grow lights. my roof area gets a lot of light, but my windows might not be getting enough. so are those plastic cups big enough to last until they're transplanted outside? we seem to be growing a few similar things. i am also doing tomatoes (four different kinds), peppers (four different kinds, though only three have sprouted), and eggplant. 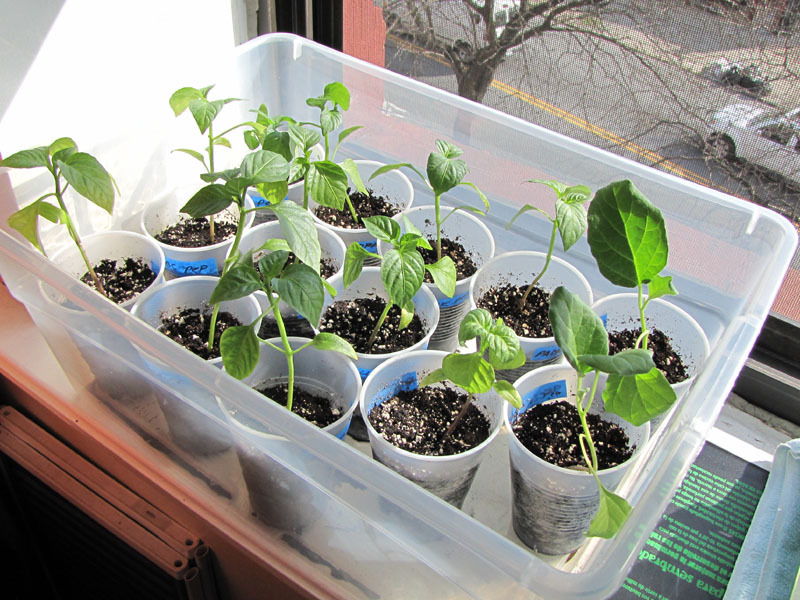 i also planted a bunch of zinnia, which have sprouted and seem to be doing well. outside i have a raspberry bush (my brother in law gave me clippings and they're doing great), mesclun greens, spinach, and peas. i also want to do strawberries and maybe some cucumber or zucchini. i'm not sure yet. i'm going to stick with what i have for now, i don't want to overwhelm myself, being a first time gardener and all. i just have a lot of space and like variety. oh, and i'm also in bushwick (well, i'm technically still in williamsburg, off the montrose L). so swapping should be easy. Hi Grace, yes they'll stay in those cups until they get transplanted into their final home. Also, you don't need fancy grow lights. Those compact fluorescent bulbs that burn a very cool blue (6500K color temp) are fine to use. I have one of those in a desktop lamp placed right over the dome, about an inch away from the surface. I leave it on for about 14 hours a day. You can also place a towel underneath the tray to help it retain heat at night.